Every once in a while I can’t resist a photo op! 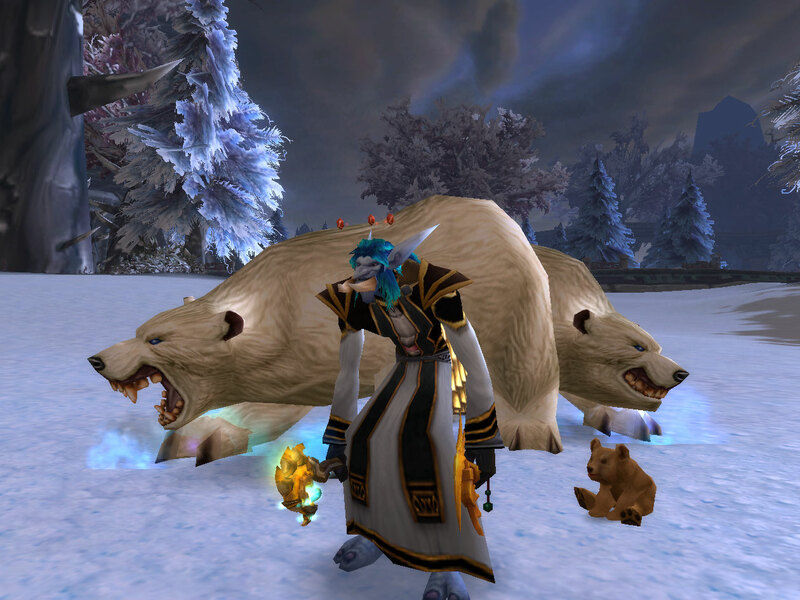 I had a nice little bear collection in Zul’drak. These two female bears decided to follow me around when I had my little Hyjal Bear Cub with me. Because I didn’t have to work on Good Friday, I decided to spend some time in Zul’drak. This was the last Northrend zone that I hadn’t finished. It started off rather boringly, but when I was about 40% of the way through the quests, I stopped being able to find new quests. Of course, that usually means there’s a quest item I missed. I checked my inventory, and there it was. The Unliving Choker started a chain in which I was disguised as Scourge and worked for Drakuru. This was really interesting. It was a nice break from stereotypical quests. Many of the quests tasked me with getting NPCs to do things. It was a little bit like playing an RTS if you only controlled one unit. By finishing Zul’Drak, I also finished Northrend. Now that I’ve finished Outland, Northrend, the Cataclysm zones, and Pandaria, it just leaves Kalimdor and the Eastern Kingdoms. This means, for me, the questing grind is over. I don’t plan on grinding out Kalimdor or Eastern Kingdoms because Mooglegem needs them too. I’m not going to bother with those zones on Devee; we’re going to do them on new characters. 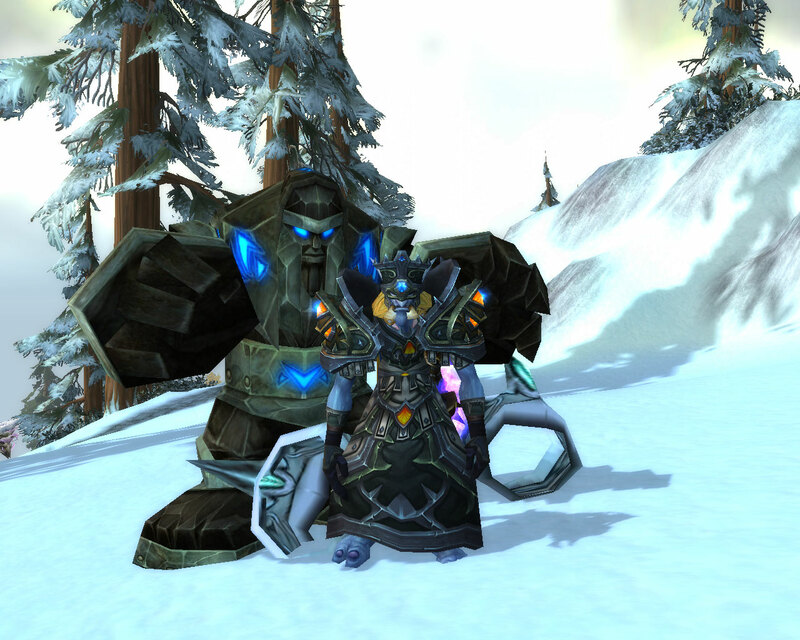 Whether or not we ever get around to it is still a question worth considering, but it’s nice to have Northrend done! I finished Grizzly Hills recently. Overall, I enjoyed the story. The mechanics were nothing special, but I guess that’s like pretty much every zone. I had this new golem buddy, but he didn’t want to continue to hang out with me! While I always have trouble remembering exactly what went on in each zone, I did enjoy the story as it played out. I enjoyed the various stories – worgen, furbolgs, Loken’s forces, and especially the trolls. In the picture above I was partying with the spirits I put at ease! 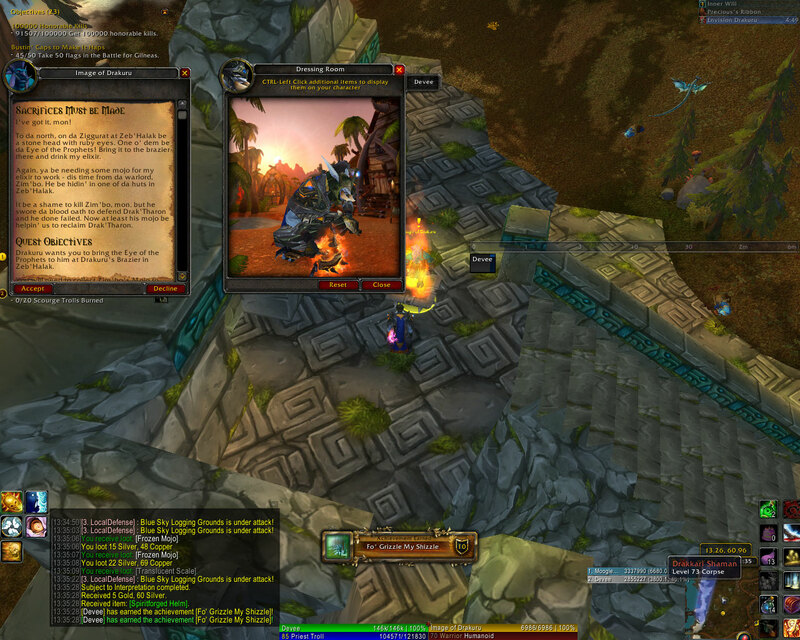 The quests in Grizzly Hills seem to lead directly into Zul’Drak. I guess most zones lead to other zones, but I liked the flow. 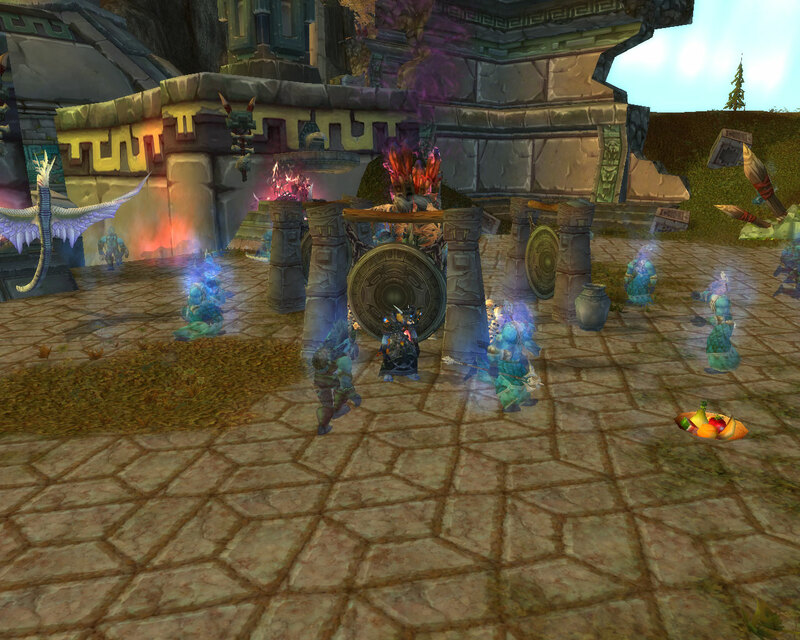 It’s also cool how Drak’Tharon Keep sits between the two zones.